We’d love your help. Let us know what’s wrong with this preview of Cold Tangerines by Shauna Niequist. To ask other readers questions about Cold Tangerines, please sign up. Would this book be appropriate for teens?? Excellent book!! I laughed and/or cried during every single chapter. Such an emotional and uplifting read. Shauna writes so honestly about such relatable topics in motherhood, friendships, marriage, etc. I highly recommend this book! My sister called me and said I had to read this book. This is an amazing and unusual event. She is a busy person - six kids among other things and I am the librarian. I usually want to tell her what to read. The other odd part is we are not always in sync about religion. And this book is definitely about religion. So I figured out I could get this book on my Kindle and downloaded it immediately. And my sister is right - I needed to read this book. Shauna is a wise soul for one so young. She remin My sister called me and said I had to read this book. This is an amazing and unusual event. She is a busy person - six kids among other things and I am the librarian. I usually want to tell her what to read. The other odd part is we are not always in sync about religion. And this book is definitely about religion. So I figured out I could get this book on my Kindle and downloaded it immediately. And my sister is right - I needed to read this book. Shauna is a wise soul for one so young. She reminded me to really look at the world. To see what an incredible miracle this world is - what wondrous things God has done. A realization came to me about midway through reading this book. I was enjoying the short anecdotal chapters with memoirs and creative thoughts from the author. It was certainly different than my usual reading that I gravitate towards, but that was part of my reason for picking it off the shelf to read. Anyhow, I'm about halfway through when, much like realizing you've somehow walked into the women's section of clothing at the department store and been staring at the clothes for a while even tho A realization came to me about midway through reading this book. I was enjoying the short anecdotal chapters with memoirs and creative thoughts from the author. It was certainly different than my usual reading that I gravitate towards, but that was part of my reason for picking it off the shelf to read. Anyhow, I'm about halfway through when, much like realizing you've somehow walked into the women's section of clothing at the department store and been staring at the clothes for a while even though you're a guy, I had been reading a book really geared more towards an audience of women than men. I don't feel sexist in saying this because Niequist is just very open about her struggles, insecurities and life issues which will involve thoughts around body image, motherhood, and other feminine-specific things. In a sense this book helped me a bit to see the "other side" so to speak. But ultimately, and I believe this was the purpose, this book challenged me to see the beauty of life and to not allow the insignificant parts of life to crowd out the significant ones. Admittedly, when I realized that this was a "faith-based" book, I was hesitant; where the author carries her faith in God, I'm more of a "universe" and karma-based kind of girl. That said? Even our differing beliefs had no effect on how much I adored this book. Although there were the strong undercurrents of a religion I don't subscribe to, it was easy enough for me to skip over certain passages or mentally adapt certain passages to suit my own beliefs. Faith differences aside, I settled in happily Admittedly, when I realized that this was a "faith-based" book, I was hesitant; where the author carries her faith in God, I'm more of a "universe" and karma-based kind of girl. Faith differences aside, I settled in happily to story after story of the beauty in everyday life—something I celebrate fiercely, and appreciated even moreso after devouring this collection of mini-essays by someone who finds the same joy I do in seizing the moment. I loved the way she looked at events, finding lessons & pulling out drops of inspiration from interactions with friends, the changing of seasons, and life transitions. It felt like settling into a comfy couch with an old, equally optimistic friend. I don't believe this book is meant to be gobbled up in one sitting but rather one bite at a time. No matter your faith, you cannot deny the vulnerable truths the author shares from her personal experiences. You may even find yourself in the pages. Yet another case of blogger-turned-author, with both things not being equal. Sometimes people with popular blogs get asked to write books. This seems especially true within the Christian blogging community. At any rate, their books become just a series of short essays, which actually read like blog posts. Whimsical, observant blog posts and thoughtful essays are not the same thing. This book was divided into four sections as a means of trying to categorize each "essay," but there was really no ce Yet another case of blogger-turned-author, with both things not being equal. Sometimes people with popular blogs get asked to write books. This seems especially true within the Christian blogging community. At any rate, their books become just a series of short essays, which actually read like blog posts. Whimsical, observant blog posts and thoughtful essays are not the same thing. This book was divided into four sections as a means of trying to categorize each "essay," but there was really no central theme or idea. It really wasn't about celebrating life and noticing the small things either because the two things I remember most about this book, which I read over several weeks, a couple of "essays" at a time, were Niequist's whining about how EXHAUSTING pregnancy is and how devastating it was to leave a job. Although some of the reviews rave about her transparency, she never clearly stated whether she left her job of her own will (that's the impression I got) or whether she was asked to leave, but either way...process it and move on. There were multiple essays about wallowing in that grief in a book that was supposed to offer "bright and varied glimpses of hope and redemption." My other beef with this book was that she seems to portray herself being "too cool" for a faith that involves serious consideration of the Bible. She states in an interview at the end of the book "I have encountered some friction, but only from Christians who wish the book were more like a conventional devotional or a a Christian Living book." I wasn't expecting this book to be that. I was expecting thoughtful essays that brought me A-ha or "me too" moments about God. However, when she writes "Last winter, I did a study on Exodus. Not the kind of Bible study I'm used to, because I usually do the kind where a bunch of friends meet at someone's house or a coffee shop and occasionally we do the actual study but mostly we talk and tell stories and pray at the end. This was that other kind, the kind where you have a really big commentary book, and it's hard to get through the reading if you're working on it during the commercial breaks of The Bachelor in Paris the night before." Seriously? Is she 14 years old? My other problem was the strong sense of privilege and entitlement. So much writing about eating out at restaurants, sailing, traveling frequently (esp. internationally), etc. There's no problem with that as long as one recognizes that this type of lifestyle doesn't resonate with and/or is not attainable (or desired) by many of her readers. However, my sense was that Niequist thinks this is the way the world works. For example, in the essay "How Sweet It Is": "One year we declared the best moment (of the summer) was when, after three cold and rainy days of Memorial Day weekend, with each boat full of shivering, wet, disappointed guests, we abandoned ship and opened the yacht club, the only dry place left, and climbed behind the bar to mix drinks, leaving a tab for the staff to bill us later. We spread our wet jackets and fleeces over the chandeliers to dry, and left soggy footprints all over the tile behind the bar." So they broke into a closed bar...at a yacht club...helped themselves to alcohol...and put their wet clothes all over the place and left a mess behind!?! How is that "cute"?...or okay? One of my favorite reads of the year. It took me exactly a month to read it, and I postponed reading new chapters as much as I could, because I wanted to savor it. Shauna has a beautiful gift. I will read it over and over again, I'm sure. This book is uplifting, easy to understand, encouraging and brings joy. The reason I gave it 3.5 stars is because there are stories that I didn't feel the connection to. Cold Tangerine talk about God, but it does not have scriptures in it (which is fine of course). It's more like a reading someone's journal about her experience with God. It has 40 stories in it, and it divided into 4 sections. This book will encourage us to be more grateful, to appreciate little things, and to not take everything for granted. I was shopping for a Christmas present for my mom in Body Shop when I saw that they have new stocks of my favorite body butter scent, tangerine. That scent became my favorite by accident years ago, when I went there to claim my Love Your Body membership birthday gift, and they gave me a small bottle of their tangerine-scented lotion and body wash. I used it for the gym and loved it, and eventually bought more until I got broke and realized that my daily bath stuff are too expensive. So while I w I was shopping for a Christmas present for my mom in Body Shop when I saw that they have new stocks of my favorite body butter scent, tangerine. That scent became my favorite by accident years ago, when I went there to claim my Love Your Body membership birthday gift, and they gave me a small bottle of their tangerine-scented lotion and body wash. I used it for the gym and loved it, and eventually bought more until I got broke and realized that my daily bath stuff are too expensive. So while I was there, buying a Christmas present for my mom, I decided to get a tub of the tangerine body butter, since it's on sale anyway. Plus, the scent just really cheers me up. I'd like to believe that the moment I had with that body butter was something that Shauna Niequist was pointing at in her first book, Cold Tangerines. The subtitle alone is an indication of it: Celebrating the extraordinary nature of everyday life. Plus the fact that what I bought was a tangerine scented body butter, it kinda fits the entire thing, right? Anyway. I loved the first Shauna Niequist book I read, Bittersweet: Thoughts on Change, Grace, and Learning the Hard Way , so when I saw that her two other books were on sale on Kindle on early December morning, I immediately bought it. I was a little afraid that her books might be those one-hit thing, meaning I won't really like the others I read because I won't be able to relate to it, but I shouldn't have feared anything with her first book because it was exactly what Bittersweet was for me when I first read it: it came at the right time in my life. Cold Tangerines is exactly about what it says: celebrating the extraordinary nature of everyday life. Here, Shauna Niequist talks about the many little ways that God shows Himself in life, how the natural becomes spiritual, and how the physical things we see and we do are all connected to how we are nourished spiritually. There's food, friendship, writing, traveling. There's body issues, vacations, heartbreak, family. Shauna shared stories of her personal life, much like how she also did in Bittersweet, and then points the reader to God, and His faithfulness and His wonder in the ordinary life that she had. Which means, we too, can see this, the extraordinary in our everyday life. I loved how easy it was to relate to her stories in this book, and whatever stage of life I was in, I would be able to find wisdom and advice in this book. Shauna's honesty shone in this book, and when I read the part about how hard it was for her to write in this book, I realized how much she must have struggled to put these words on paper. But that struggle was a blessing, at least for me, because I know that struggle, too. I feel that every time I write a post for my personal blog, wrestling with the words in hopes of them being used for something. And then there's the forgiveness chapter, one of my favorites, which really and truly came at the right time because I was struggling to forgive and ask for forgiveness from someone as well. Like Bittersweet, I think I highlighted almost half of the book -- there were just so many quotes to keep -- the ones I added below are just a glimpse of it, really. I don't plan on using my tangerine-scented body butter everyday because I don't want to run out of it too fast. But I do take the time to smell it everyday, in a way to remind me that I can choose to see my life as sweet and happy, because it really is. 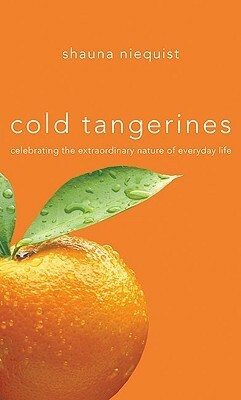 And that is what Shauna Niequist's Cold Tangerines is -- a reminder that there is something super in our natural life. Cold Tangerines is the kind of book I would recommend someone to read especially for the New Year. It's fresh and honest and funny and inspiring, and I think it would help set the mood for the fresh start that everyone's looking for in the turn of the year. Or if it's not the New Year, read this, still. This book is a reminder that there is beauty and hope and redemption in this extraordinary everyday life. "Cold Tangerines" is a collection of little "gems" from Shauna Niequist's life; actually, it read more like a blog than a novel. I appreciate that she was able to focus each story around a very specific event from her past and provide the reader with take-away lessons. Likely because I had a very ordinary adolescence (feelings of awkwardness, doubting myself and whether or not anyone liked me, found fault with my body, etc. ), it was easy to resonate with many of these stories. Niequist's writing "Cold Tangerines" is a collection of little "gems" from Shauna Niequist's life; actually, it read more like a blog than a novel. I appreciate that she was able to focus each story around a very specific event from her past and provide the reader with take-away lessons. Likely because I had a very ordinary adolescence (feelings of awkwardness, doubting myself and whether or not anyone liked me, found fault with my body, etc. ), it was easy to resonate with many of these stories. This is a book I would have missed if I hadn't been paying attention to my goodreads friends. I saw it on a couple of lists and thought I would enjoy it. Thanks Tammra and Cindi. Cold Tangerines is a delightful romp through the mundane of our days and extraordinary of our everyday. Choosing to see the gifts that surround us. Choosing to see the goodness of God. Shauna Niequist has that gift for writing that all good writers of this type have, a willingness to be razor honest about themselves. T This is a book I would have missed if I hadn't been paying attention to my goodreads friends. I saw it on a couple of lists and thought I would enjoy it. Thanks Tammra and Cindi. I think she reads my mind. She must. She writes; I relate like no other. What a gift. Bright inspiration since Page 1. I'll read her upcoming book madly the week it comes out. And I might just start collecting pennies too. I heard Shauna Niequist speak and read from her book at the Festival of Faith and Writing this spring. Cold Tangerines is a collection of essays about celebrating and living life to the fullest. The writing style is colloquial and sounds just like the way Shauna speaks. But, she is a friendly and joyful sort of person, so I enjoyed her stories very much. I appreciated her honesty about the tough seasons in her life, and I think I will go back and reread the essays about writing and creativity. 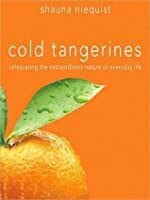 Ever since I read Shauna Niequist's Bittersweet, I've meant to read Cold Tangerines. I finally tracked down a copy and realized I read both books at the perfect seasons of my life. Her books feel like a good conversation with a friend. Honest, authentic, real. She asks good questions and provides soul-stirring responses. Because of how intimately I react to her books, if you want to know more, you'll have to ply me with my drink of choice first. I thought this was a good book and good ideas that I should definitely take. But she was pretty dramatic and to the point that I don't think a lot of people are like that. She also has some weird views that I don't agree with, but I loved reading about when she was pregnant with her son and her relationship with her husband seems really good. But overall I thought it was a good book, but just tiring by the end. This book was like sitting down with my best friend. There is something here for everyone, no matter what stage of life you are in. It made me laugh, cry, think. It made me warmer in my soul and I'm a different person having read it. Or perhaps not a different person - but more aware and thankful for who God created me to be. Nice, but not nearly as good as Bread & Wine. reads like a conversation with a best friend. powerful and poignant stories to encourage and draw you into a life worth living. So good! An honest, authentic reminder to live life to the fullest and to celebrate this life we’ve been given, the big moments, and the small, everyday moments. Need to buy, not just check out from library! I loved a lot of things about this book but it annoyed me a little bit too...it reads almost like the author's journal....personal and introspective....like it was written for her and not for anyone else. And it was a little dramatic at times....jealousy, anger, inability to forgive, big issues with a job change....I'm not someone who lets that stuff bother me so it all seemed very dramatic and over-the-top. I just couldn't relate. I had a hard time getting over the fact that this book was not at all what I expected. Based on the title/subtitle and the back blurb, I was anticipating something vaguely One Thousand Gifts-ish. The introduction and the last essay (also titled “Cold Tangerines”) were pretty much exactly in line with what I expected, but everything in between went a totally different direction. It wasn’t bad; it was just a little jarring, since it didn’t feel like what the introduction set me up for. The book is I had a hard time getting over the fact that this book was not at all what I expected. Based on the title/subtitle and the back blurb, I was anticipating something vaguely One Thousand Gifts-ish. The introduction and the last essay (also titled “Cold Tangerines”) were pretty much exactly in line with what I expected, but everything in between went a totally different direction. It wasn’t bad; it was just a little jarring, since it didn’t feel like what the introduction set me up for. The book is essentially memoir, set apart from your typical memoir by its format as a collection of stand-alone essays. But the essays aren’t so much about ordinary things like “cold tangerines”; many of them are about monumental life experiences (the birth of a baby, weddings, funerals, job loss, moving out of state). Once I stopped thinking about all that, I did enjoy the book quite a bit. As a writer/reader, I found this book richly satisfying. Shauna Niequist is a gifted writer; the thing that stuck out to me most was her use of metaphors. She has this impressive ability to come up with vivid, fresh ways to describe events and experiences and emotions. And yet...spiritually, I found the book less satisfying. The book was full of vague references to “faith” or “the divine” or “hope,” occasionally “God,” without any more specific discussion of *what* we hope in, or *who* brought “redemption” and *how*. I recognize it’s a memoir, not a systematic theology. But when a Christian’s memoir isn’t shot through with Jesus, barely even mentions Him, I notice, and I wonder why. I believe with all my heart that an assumed gospel leads quickly to an abandoned/rejected/forgotten gospel. "The day I left my job...was the darkest day of my life so far. It felt like a curse, a punch in the face, a slice to the core. It made me feel like my luck had run out cosmically, and from then on, all I could expect was rain. But the only person who decided my life had turned to dust was me...I would never have wanted it this way, but something bright and beautiful has been given to me, and I'm in grave danger of losing it, squandering it, becoming a person who cannot find the goodness that's right in front of her because of the sadness that she chooses to let obscure it." "Life sneaks up on us every once in a while and gives us something we didn't even know we wanted, and lights within us a love we didn't even know existed."